May you enjoy that table as long as you want to! It's lovely. It is beautiful. I love that you left the wood natural and it gives the table such character. So pretty. What a beautiful table and what a lovely tribute to your dad. Ok I put a comment and it disappeared! lol...just wanted to say that I love love love the look! As I was cleaning my kitchen counters and rearranging the bread boards that I bought from you it got me thinking that you haven't posted anything lately. I now know why. The table is absolutely beautiful and so is the rustic buffet with the arrangement of bread boards. I notice that you were busy painting as well. Was the chalkboard wall to dark for the space? I liked how it looked with the other light color walls and wood accents. Glad to read that you are okay but just busy. Looking forward to reading about your other projects. it made my day to see a new post from you! and i adore your table and rustic buffet. i know how special the table legs mean to you knowing the special bond between you and your dad....every time you sit at your table in a small way he's "with" you. hope you find time to blog more in the future but it sometimes is hard to find the time. take care diana! Just the perfect table for that room! 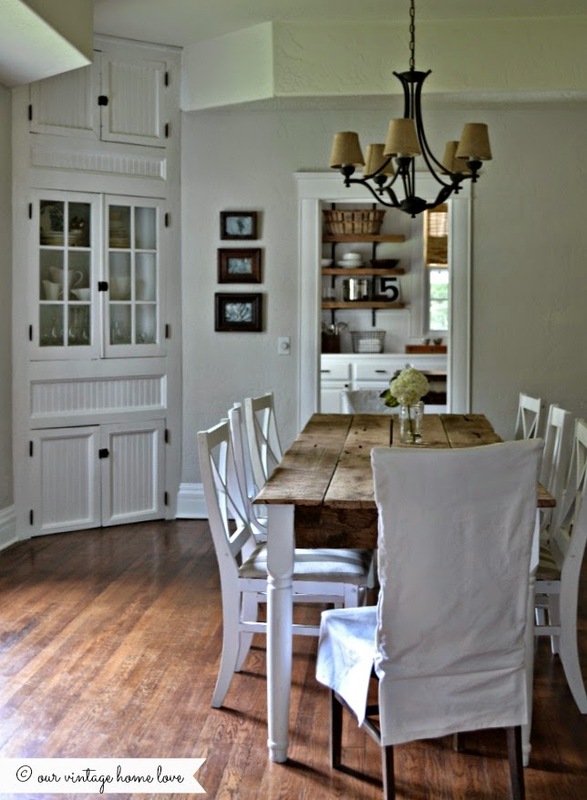 looks gorgeous absolutely love your dining room. Simple and beautiful. Great job. So glad your back and I love both the table and buffet. 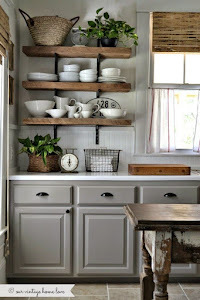 Everything you do is eye candy for sure - me and my hubby have been discussing building a tall shelf unit like yours. I can't wait! oh man that is beautiful! LOVE it! Oh! Love at first sight! Not only gorgeous, but so neat that it has a special connection to your father. 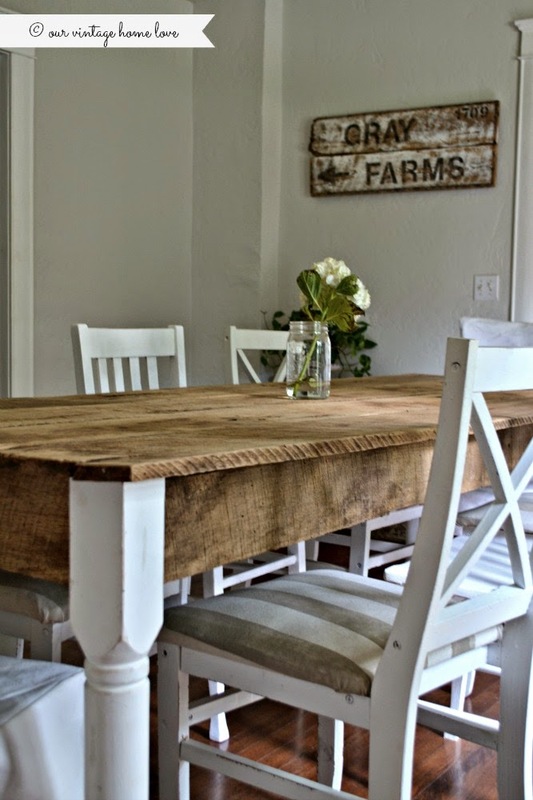 Seriously... the most gorgeous farm table I have ever laid eyes on! The table is seriously gorgeous and such a great size. 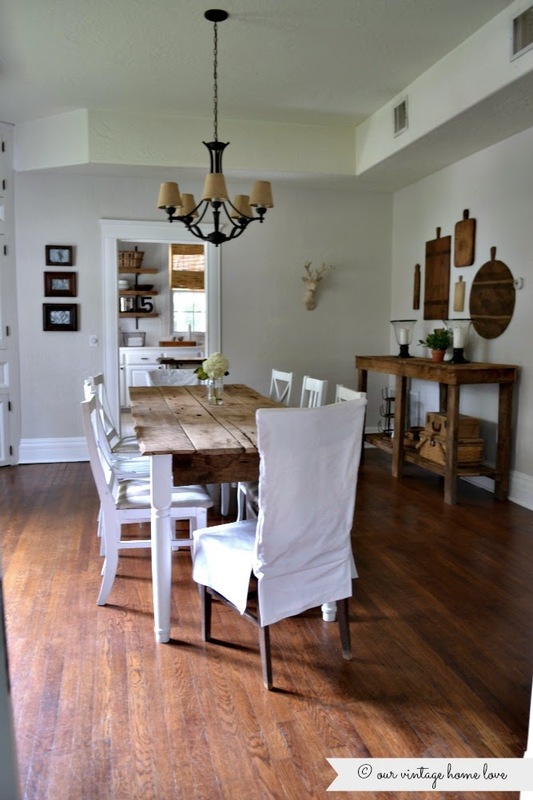 Love the whole dining room and I think it is awesome that you have such a big space to use for your dining room as ours is on the tiny side. Absolutely beautiful! I think it's so special that you could incorporate the table legs your father made. You both have talents that amaze me. I've really missed you! I've had technical/computer/internet issues for months so haven't been able to visit. Glad you're back! My girlfriend said, "You've got to go to this girl's blog!" She was right. It's great. I just finished going through the whole thing. You and your husband remind me a lot of me and my husband. We're into vintage and we also make things. I really liked your story about the bread boards and how you put "Dad" on the side. It was very touching. I'll see you again! Love it!!!! 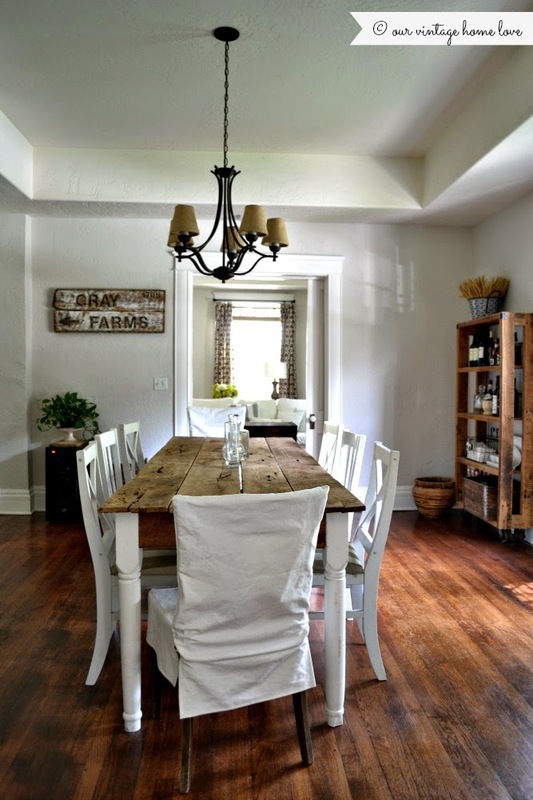 Simple, rustic and perfect. I love old barn wood .. unfortunately out here in the Southwest we don't do old so we don't get the chance to get reclaimed items .. unless it's from the 1980s then we will be set. I absolutely love your style. I especially like your arrangement of bread boards. 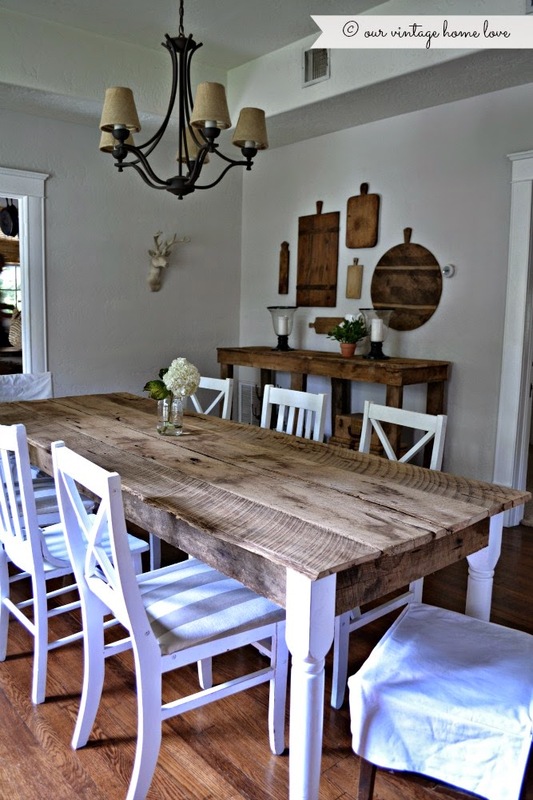 The table is one of the greatest, best, most beautiful, rustic and reclaimed I have ever seen. The sign is great too. Can I just have your kitchen? 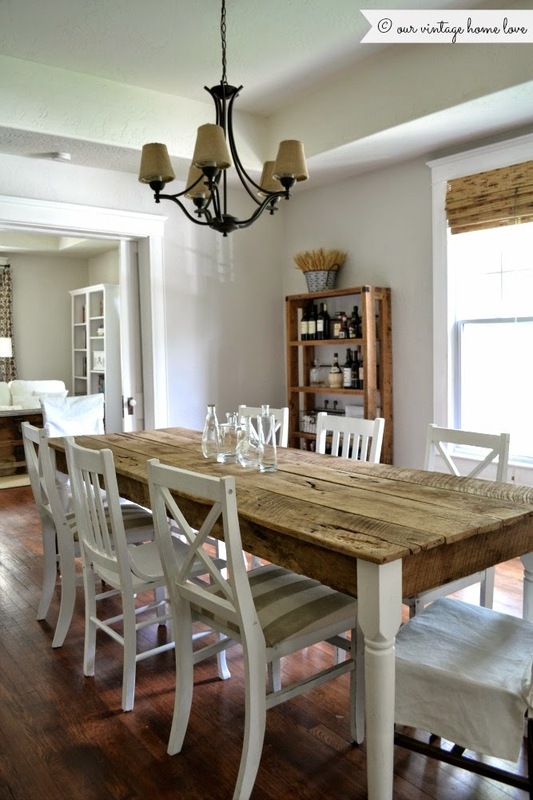 Found you on pintrest, spent the last hour drooling over your home photos and projects! In another post, you mentioned you weren't sure how to fill a large room. 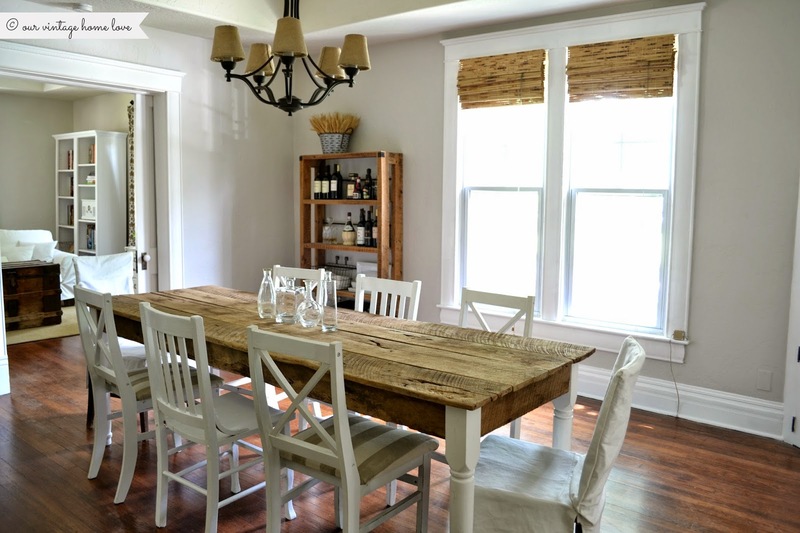 Have you thought about switching one of your living spaces with the dining room? We had a formal dining room we used 1x year, we had a decent eating area in the kitchen so we made it our living room.. Its better use of the space for sure! (For our family anyways) And we haven't missed the formal dining table/space when hosting holidays. Again, loving your home!